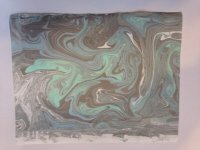 Join us in the mindfulness practice of suminagashi—a Japanese form of paper marbling. It’s very much about the senses, about combining nature, yourself and art all in one. Suminagashi, literally means “floating ink.” The process involves dropping special inks onto still water. 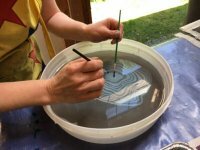 The inks can be allowed to swirl on their own as they meet with the gentle undulations of the water itself or can be manipulated into whirly patterns with a thin tip or with a gentle breath. The ink is picked up by laying the paper on top of the finished floating ink design. We will use a variety of paper surfaces, textured and smooth, and paper types including kozo paper to lift our designs. 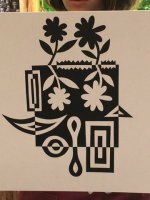 We will experiment with the Japanese art form, Notan, to create compositions of shape and background using positive and negative space. Notan, which means light-dark balance—think of the Yin Yang symbol—is a guiding principle of Eastern art and design. The use of positive space (items that take up space) and negative space (empty space) makes a wonderful metaphor for life–what we bring in, where we let it take up room, and the opposite of one thing in the place of another.